Includes the names: Mrs. Trollope, Frances Trollop, Frances Trollope, Francis Trollope, Frances Trollope, Mrs Fanny Trollope, Frances M. Trollope, Mrs. Frances Trollope, Frances Milton Trollope, Frances Hilton Trollope ... (see complete list), 1780-1863. 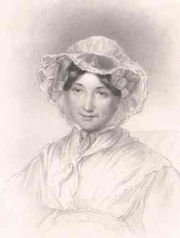 TROLLOPE Frances Milton, FRANCES Milton Trollope 1780-1863. Do not confuse or combine her with her daughter-in-law Frances Eleanor Trollope, née Ternan (1835-1913), also a novelist. Frances Milton Trollope was a prolific English novelist and writer who often used her works as social commentary. In 1809, at age 30, she married Thomas A. Trollope, a lawyer with whom she had seven children. In 1827, she traveled to the USA and stayed at the experimental utopian community, Nashoba Commune, near Memphis, Tennessee. After her return to England, she began writing to help support her family. Her first book, Domestic Manners of the Americans (1832), was a bestseller and caused a sensation both in the UK and the USA for its unflattering view of American society. During her career, she published some 100 volumes. In the late 1830s, she moved to Florence, Italy, where she lived until her death. Fanny Trollope is currently considered a "single author." If one or more works are by a distinct, homonymous authors, go ahead and split the author. Fanny Trollope is composed of 13 names. You can examine and separate out names.